Prentiss D. (Walker) McClelland was born and raised in Denmark, Tennessee and is the seventh child of 10 children. She moved to Mil-waukee, Wisconsin after graduating from high school to attend UW-Milwaukee to study Journalism. She met her future husband Charles McClelland in Milwaukee and has been married for 39 years. 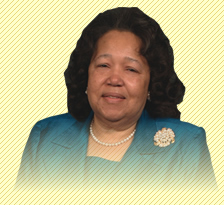 Lady McClelland serves as the Vice President of the “Word Of Hope Ministries Inc.” (1995) a separate nonprofit 501 © 3 organization of Holy Cathedral. Her responsibility is to oversee the day to day operations of all the components of this ministry; which includes Health and Social Services, Technology, Employment, ATODA (Alcohol, tobacco and other drug abuse) and a Pris-oner Re-entry program. She has worked at Word of Hope since its’ inception in 1996. This is a “Ministry That Touches People” and she is fulfilling her mission. She also worked at Blue Cross Blue Shield for over twenty years. Lady McClelland serves in many capacities at Holy Cathedral. She is the Editor of the Newslet-ter Committee, Director of Women’s Ministry, and serves as Coordinator for the Church Bulletin Committee and Church announcers. In August 2008 her husband was appointed to serve as the Jurisdictional Prelate of Wisconsin Northwest Jurisdiction. She is now the First Lady of the Wisconsin Northwest Jurisdiction and believes that with “God all things are possible.” Lady McClelland is also a very gifted and anointed Teacher/Speaker having presented locally as well as nationally in churches, conferences, and other venues.